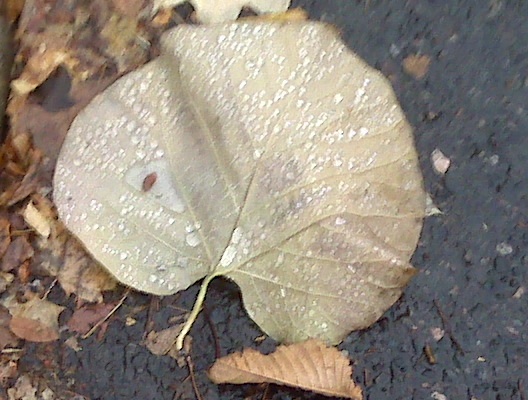 Walking out today, I looked down and saw this leaf covered in raindrops. I thought how beautiful it was and how I should take a photo of it. Sadly, this photo doesn’t do it justice. them justice, either. It often has nothing to do with meanspiritedness. More often it is the case that we are not aware of them, or not aware of the goodness that they possess. Their goodness is wasted in that sense. making it new and better. was an old sleigh, long gone. no one is without value. No one is a waste. the dead animals that fall through force or through nature feed others. If you donate your organs, others may see things they love with your eyes, and feel your old heart in their chest quicken at the sight of them. Though much is lost, all can be transformed, everyone can be redeemed, and nothing need be wasted. As always, thanks for reading this.